The OECD taking part in Expo Milano 2015 upon the invitation of the Italian Foreign Ministry. Expo Milano’s theme “Feeding the Planet, Energy for Life” provides a unique opportunity for the OECD to encourage dialogue in areas such as agricultural policy, food security and nutrition, rural development, sustainability, territorial governance and well-being. This website will chronicle OECD’s participation at Expo Milano and provide background and links to key OECD work on the many of the issues being raised. Calendar of events, list of contacts and press releases related to Expo Milano themes. Food security exists when all people, at all times, have physical, social and economic access to sufficient, safe and nutritious food to meet their dietary needs and food preferences for an active and healthy life. This definition implies that people will only be food secure when sufficient food is available, they have access to it, and it is well utilised. A fourth requirement is the stability of those three dimensions over time, which means the ability to manage risks effectively. The OECD has analysed how changes to the functioning of world’s food and agriculture system can contribute to reduced hunger and the attainment of global food security, and has been an active contributor to the discussions on food security and agriculture in the G20 forum since 2010. OECD FAO and UNCDF have also launched a joint initiative to pilot, assess and scale up innovative policy approaches and governance mechanisms to improve food security and nutrition in rural areas across developing countries. A first deliverable of this project, which is currently being implemented and encompasses case studies from Colombia, Peru, Morocco, and Cote d Ivoire, will be presented in Milan on 19-20 October in an event organised by the municipality and other national institutions. Food safety is a primary and legitimate requirement from consumers. Modern biotechnologies are applied to plants, animals and micro-organisms; and the safety of the resulting products constitutes a challenge. They are rigorously assessed to ensure high safety standards for environment, human food and animal feed. ‘Biotech’ plants have characteristics such as resistance to insects and diseases, drought or flood tolerance (adaptation to climate change), improved content of vitamins or other constituent, better preservation, and other promising features. Genetically-engineered crops are increasingly cultivated in countries having approved them and are then marketed worldwide and enter in the composition of ‘novel’ foods and feeds. In addition, new ingredients such as insects, algae or biofuel by-products start to be considered as potential sources of food and feed in the future. The OECD Task Force for the Safety of Novel Foods and Feeds assists countries in evaluating the potential risk from genetically-engineered crops and other ‘biotech’ products, facilitating harmonisation of assessment practices and mutual understanding between regulations. The main outputs are the Consensus Documents which compile science-based information on key composition elements (nutrients, anti-nutrients, toxicants, allergens) of important agricultural species: rice, soybean, sunflower, cotton, wheat, and many others. These guidance documents constitute reference tools that can be used to compare novel foods and feeds with conventional ones as part of the safety assessments. More on OECD risk/safety assessment in modern biotechnology, food, feed and environmental safety. Unhealthy diet is the single risk factor responsible for the highest share of mortality and morbidity. In 2010, more than 11 million deaths worldwide were amenable to obesity-related diseases like diabetes, cancers and heart diseases representing up to 7% of healthcare budgets. OECD collaborates with the World Health Organization (WHO) and other international organisations to support the implementation of the Political Declaration to tackle chronic diseases adopted by the UN General Assembly in 2011. Our work shows that interventions favouring a healthier diet are affordable and can prevent millions of people living with a disease. Are our lives getting better? How can policies improve our lives? Are we measuring the right things? For over a decade, the OECD has been working on how to measure progress and welfare in societies beyond the measure of GDP. 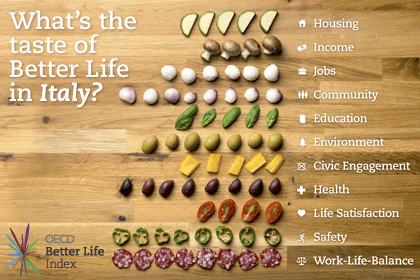 The OECD Better Life Initiative, launched in 2011, focuses on the aspects of life that matter to people and that shape their quality of life. The Initiative comprises a set of regularly updated well-being indicators and an analysis, published in the How’s Life? report as well as an interactive web application, the Better Life Index. It also includes a number of methodological and research projects to improve the information base towards a better understanding of well-being trends and their drivers. The Better Life Index invites people to create and share their own well-being index depending on the weight they give to eleven topics, ranging from housing to safety, education, employment, the environment and health. To date, the Index has received more than 6 million visits and over 90 000 people have shared their views on what’s most important for a better life. The consistent interest and participation from users around the world has prompted the introduction of six language sites, including English, French, German, Portuguese, Russian and Spanish. On 18 May, the OECD will unveil the first Italian version of the Better Life Index. The Italian translation was made possible with the generous support of the Italian Ministry of Foreign Affairs. Reducing food losses and food waste is attracting growing public attention at the international, regional, and national levels, and is widely acknowledged to contribute to abating interlinked sustainability challenges such as food security, climate change, and water shortage. However, the pattern and scale of food waste throughout the supply chain remains poorly understood, despite growing media coverage and public concerns in recent years. The OECD has recently released a food waste dataset of best available data for 31 countries, and has developed three in-depth case-studies of food loss and waste policy practices in Japan, the United Kingdom and China. These reviews explore the challenges ahead, implications and policy requirements of reduced food waste levels. Food is not only vital for survival and well-being, it is a key part of all cultures, a major element of intangible heritage and an increasingly important attraction for tourists. The linkages between food and tourism also provide a platform for local economic and agriculture development and local products, which can be strengthened by the use of food experiences for branding and marketing destinations. OECD Centre for Entrepreneurship, SMEs and Local Development and the Ministry of Culture, Sports and Tourism of Korea will co-organise a conference on the theme "Hansik Cuisine: Promoting Korean Food, Culture and Tourism" on 24 June 2015, as part of Expo Milano 2015. The event will take place during Korea Week and builds upon OECD-Korea work on Food and the Tourism Experience. It will focus on the importance of food as a nexus of cultural, economic and social growth and diversity, with speakers from France, Ireland, Italy, Korea and Portugal. Together with the UN Food and Agriculture Organization (FAO), OECD provides an annual assessment of prospects for the coming decade of national, regional and global agricultural commodity markets in the form of the Agricultural Outlook. OECD also collaborates with other international organisations on the Agricultural Market Information System (AMIS) to enhance food market transparency and encourage coordination of policy action in response to market uncertainty. Fisheries and aquaculture are an important source of nutrition, especially for developing countries where in many cases it is the main source of protein. Aquaculture has been the fastest growing food commodity for the last 20 years and is poised to become a major part of the global food supply. The OECD is working to identify the best ways to sustainably develop fisheries and aquaculture by collecting and sharing information on fisheries policies, support and activities. Agriculture is one of the few sectors that can both contribute to mitigation and sequestration of carbon emissions and accounting for agriculture’s carbon footprint is necessary, particularly if agriculture is included in greenhouse gas reduction commitments. However, the range and variability of estimates, and the complexity and uncertainty of accounting for indirect land use change remain to be resolved. Policies will play a role in enhancing the ability of agriculture to adapt to climate change, while also contributing to other environmental goals. Work in the OECD will continue to support the process following the forthcoming Conference of the Parties (COP 21) to the 1992 United Nations Framework Convention on Climate Change (UNFCCC). Sustainable agriculture uses principles of ecology and takes into account the relationships between organisms and their environment. OECD's work focuses on multiple areas in the field including green growth, agri-environmental indicators, and agriculture and climate change. Agriculture accounts for around 70% of water used in the world today and also contributes to water pollution from excess nutrients, pesticides and other pollutants. Population growth, urbanisation, industrialisation and increasing environmental regulations are exerting greater pressure on, and competition for, limited water resources. The effects of climate change could affect water supply and agriculture through changes in the seasonal timing of rainfall and snow pack melt, as well as a higher incidence and severity of floods and droughts. Sustainable management of water in agriculture is critical to increase agricultural production, ensure water can be shared with other users and improve and maintain the environmental and social benefits of water systems. Governments need to improve the economic efficiency and environmental effectiveness of policies that seek to improve water resource use efficiency and reduce water pollution from agricultural systems. Agricultural policy describes the laws, instruments and measures related to the domestic farm sector and trade in agricultural products. Agricultural policies encompass a wide range of issues, including providing sufficient food at reasonable prices for consumers, securing food safety and improving environmental quality. OECD conducts extensive research into agricultural policies by governments around the world and has managed to quantify agriculture support indicators, which are comparable across time and between countries. Advances in agricultural productivity have led to abundant and affordable food and fibre throughout most of the developed world. Public and private agricultural research has been the foundation and basis for much of this growth and development. Investment is critical to the enhancement of agricultural productivity, and the key to promoting long-term growth. However, public, private and international investments are declining in many countries. Low levels of investment in agriculture more broadly bode poorly for long-term prospects of achieving food security in the developing world. Under the framework of the G20, the OECD has worked to analyse what steps governments might take to help close the agriculture productivity gap in a sustainable way, and has developed the Framework for Analysing Policies to Improve Agricultural Productivity, Sustainably. The OECD is the main worldwide reference for the certification and standardisation of seeds, agricultural and forestry tractors, forest reproductive material, and fruit and vegetables. Structural changes are transforming West Africa’s economy. While agriculture remains the backbone of many of the region’s economies, there are today proportionally more non-agricultural producers. Households buy more than two-thirds of their food on the market. Major changes are occurring in food value chains at the processing, transport and retailing stages. These evolutions create unprecedented opportunities for diversification and improved resilience. SWAC/OECD work explores how the goal of enhanced agricultural production and food security can be achieved by dealing simultaneously with challenges in upstream and downstream activities of the region’s food systems. In public procurement, the financial interests at stake, the volume of transactions, and the close interaction between the public and the private sectors create multiple opportunities for private gain and waste at the expense of taxpayers. Providing an adequate degree of transparency throughout the entire public procurement cycle is critical to minimising the risk of fraud, corruption and mismanagement of public funds, especially in the development of large infrastructure projects, and to levelling the playing field for businesses thereby promoting competition and assuring integrity. The OECD has engaged with the Italian anti-corruption agency (ANAC) to improve the communication, transparency and integrity strategies of the procurement procedures related to EXPO 2015. The work of the OECD, ANAC and Expo 2015 has the shared goal of leveraging on anti-corruption experience and capitalise on good practices related to the management of large projects in order to ensure the success of EXPO 2015.